Come along on a reindeer sleigh across the frozen tundra, and we’ll visit one of the last European villages to live at one with nature. 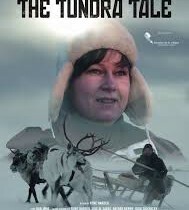 The Tundra Tale, a colorful and insightful documentary by Hamburg-based filmmaker René Harder, avoids editorial commentary, allowing the inhabitants of the Sami village of Krasnoschchelye to speak for themselves. Set in the far northwest of Russia above the Arctic Circle, 150 kilometers away from the nearest road and a couple hundred kilometers from the governmental seat in Murmansk, Krasnoschchelye can only be reached by helicopter – on Tuesdays. Unless it’s wintertime, in which case one can approach by snowmobile, over a period of weeks. This land, harsh and remote to the casual observer, is the beloved ancestral home of Alexandra (“Sascha”) Artieva and her family, traditional reindeer herders. The Sami have long understood how to eke a living out of the barrenness, growing and making most of the things they need themselves, and raising reindeer for meat and skins. Sascha, the mother of young children, represents the voice of the new generation which cares mightily about the preservation of the Sami way of life. She is a member of the fledgling Sami Parliament on the Kola Peninsula, founded in 2010 by indigenous people who had no say in the control of the land. (The Russian government has still not accepted the Sámi Parliament.) Now the herders’ Kolkhoz, or collective farm, is insolvent, and international mining corporations are plumbing the hills for their ore and minerals. The rich Russian Sami culture is threatened with extinction, and its people are looking for help. Sascha is nothing if not determined, flying in the helicopter to Murmansk to address the Sami parliament, and driving with her family in their old Soviet-built car to seek the advice of a Norwegian Sami leader. René Harder lived with the herders off and on over a period of five years, capturing the rhythms of their daily life. We eavesdrop on kitchen-table conversations. We learn about traditional healers and shamans, and watch brightly-dressed ladies rehearse folk songs. We see the men head out to the tundra on a repurposed Soviet armored vehicle, its caterpillar tracks crawling across the snow. In one thrilling sequence, we’re right in the middle of the reindeer herd as it thunders into the village. Dan Jåma’s cinematography is breathtaking throughout. The Tundra Tale introduces us to an unfamiliar place whose inhabitants live symbiotically with the land and animals they love. It’s a plea for the preservation of a unique culture.